Welded Wire offers greater strength and versatility over woven wire. It is a grid formed by wires that are fused together at their intersections. Welded wire is produced by automatic welding looms that spot weld the intersections with the short wires over the long wires instead of weaving the wires over and under as in woven wire. The welding process results in a finished product that is ready for fabrication into anything imaginable since welded wire can be simply slit, cut or shaped to fit all of your applications. Galvanized After: After the grid is formed as described above, the mesh is passed through a hot galvanizing bath which produces a highly resistant coating as well as bonding the wire together at the joints. Galvanized after welded wire results in a strong rigid material. 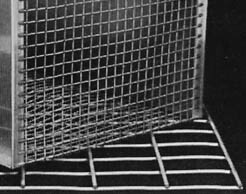 Pre-Galvanized: Plain strands of wire are passed through a bath of zinc, before the wires are spot welded together to form a mesh.